NOTE: This page is for INDIVIDUAL donations only. Click here for the Corporate donation page. 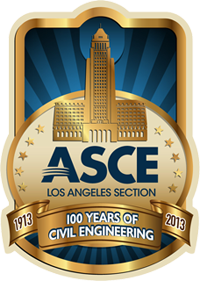 In 2013 we will be celebrating the Centennial of the Los Angeles Section. We are planning a year long celebration with activities that celebrate the contributions that civil engineers have made, and will continue to make in the future, to the development of southern California. Some of the planned events are a Centennial video highlighting significant projects and Los Angeles Section civil engineers, an Infrastructure Symposium, Centennial Celebration Dinner, K-12 Outreach, Engineers Week, History and Heritage programs, Younger Member Forum events, and student events. As a member of the Section you are invited to join us in making our Centennial celebration a tremendous success by helping us accomplish our fundraising goal of $95,000. A donation of $10 per month for the next two years or one-time payment of $240 is suggested. Of course, if you are able to make a larger donation, that would be greatly appreciated. For your convenience we have provided the opportunity to make an electronic payment below. We have a video of coming events on the YouTube ASCE channel. We hope that you will join us as a supporter or part of the team. If you wish to donate by check, please click here to download the donation form. A list of donors (names only) will be published in the L.A. Section newsletter. If you wish to not be included on the list, please email Gayle Stewart at [email protected]. ASCE Los Angeles Section is a tax-exempt corporation under section 501(c)(3) of the IRS. Our Tax ID # is 95-2594246.